A boy at the centre of a child cruelty case was "happy, loving and cared-for", a court has heard. The prosecution says that the boy from Northampton was banned from speaking at home and locked in a soiled room. 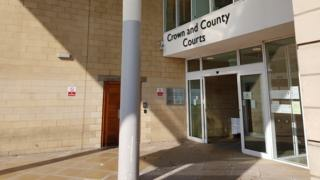 At Northampton Crown Court his parents, who cannot be named, deny multiple charges of child cruelty between 2012 and 2016. The father's defence barrister, Andrew Fitch-Holland, said the prosecution's case was "guesswork". Prosecutor Grace Hale told jurors that during police interviews, the boy's siblings said he had been made to live in a faeces-soiled room and was regularly beaten. However, Mr Fitch-Holland said the prosecution case was full of glaring and fatal flaws, and that prior to all these allegations the children were "happy, loving and cared-for". He said the children's police statements, including the evidence of brother of the boy at the centre of these claims, were "full of inconsistencies". The brother had previously outlined cruelty the boy allegedly suffered, but in the witness box changed his story. "I was saying stuff happened that didn't", he told jurors. Mr Fitch-Holland told the jury it was not a crime to be inadequate as a parent and that the boy's father had simply been "overwhelmed". The mother's defence barrister Barnaby Shaw admitted the boy's room was in a "horrific condition" but told the court he had been sleeping in a room with his brothers and not in his own room. Judge Michael Fowler, summing up, told the jury they must be sure the defendants "wilfully committed child cruelty, and did so in a manner likely to cause unnecessary suffering or injury to health".